^ Ellis, Edward Robb (1966). The Epic of New York City. Old Town Books. pp. 52. ^ a b Ellis, Edward Robb (1966). The Epic of New York City. Old Town Books. pp. 52. ^ Pierce, Carl Horton, et al. New Harlem Past and Present: the Story of an Amazing Civic Wrong, Now at Last to be Righted. New York: New Harlem Pub. Co., 1903. ^ Introduction to Harlem USA, John Henrik Clarke, 1970. ^ Elliot Willensky and Fran Leadon (2010). AIA Guide to New York City. Oxford University Press. http://books.google.com/books?id=t0gj61QSgk8C&pg=PA521&dq=%2274th+street%22+harlem+british&hl=en&sa=X&ei=X95pUdv1DePi4APfvYHgCw&ved=0CDYQ6AEwAQ#v=onepage&q=%2274th%20street%22%20harlem%20british&f=false 2013年4月13日閲覧。. ^ Eric K. Washington (2012). Manhattanville: Old Heart of West Harlem. Arcadia Publishing. 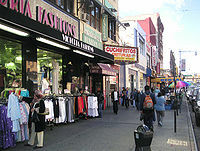 http://books.google.com/books?id=_8Rds6AN-fYC&pg=PA7&dq=%2274th+street%22+harlem+british&hl=en&sa=X&ei=X95pUdv1DePi4APfvYHgCw&ved=0CDEQ6AEwAA#v=onepage&q=%2274th%20street%22%20harlem%20british&f=false 2013年4月13日閲覧。. ^ James Renner (2007). Washington Heights, Inwood, and Marble Hill. Arcadia Publishing. http://books.google.com/books?id=OavdyyxSYcQC&pg=PA9&dq=%22East+74th%22&hl=en&sa=X&ei=kNRkUYiFMeOU0QH5wYBo&ved=0CDQQ6AEwATiYAg#v=onepage&q=%22East%2074th%22&f=false 2013年4月10日閲覧。. ^ Gill, 2011, p. 46. ^ Gill, 2011, p. 53. ^ Gill, 2011, p. 61. ^ Gill, 2011, pp. 100, 109. ^ Gill, 2011, p. 86.